I know Halloween was over a week ago but I'm still feeling spooooooky! Maybe it's because I made one of my most epic costumes EVER. I went as.... Sheila! Sheila, as in Sheila the Wonder Bike, from whom this blog is named. The idea originated with my roommate. 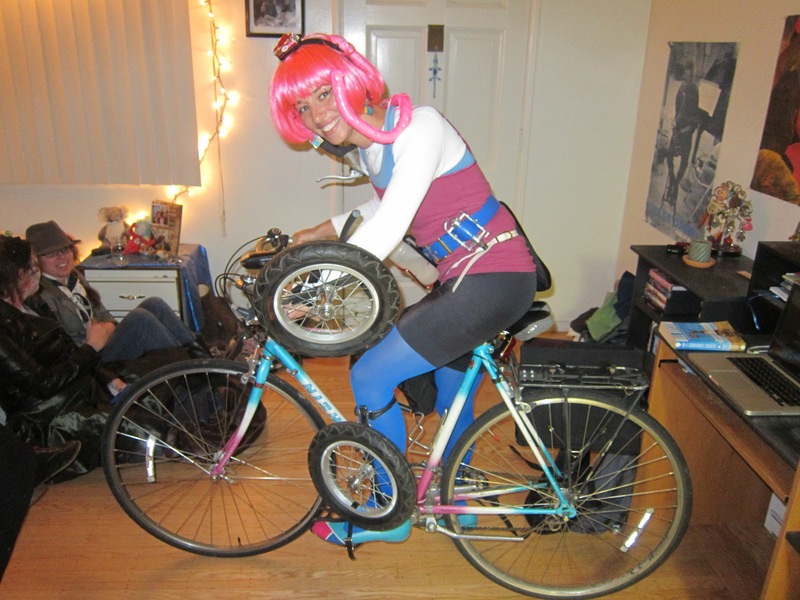 I was whining about not knowing what I should be for Halloween and my roomie responded somewhat sarcastically with, "Why don't you go as your bike because you're so in love with it." What a genius idea! 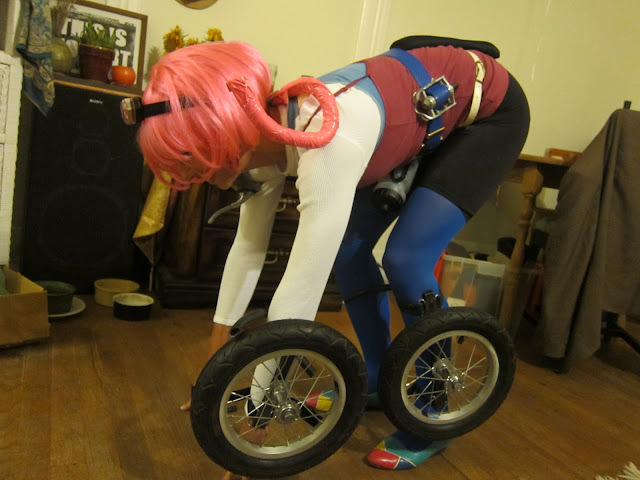 I could go as a bicycle for Halloween!... but how??? 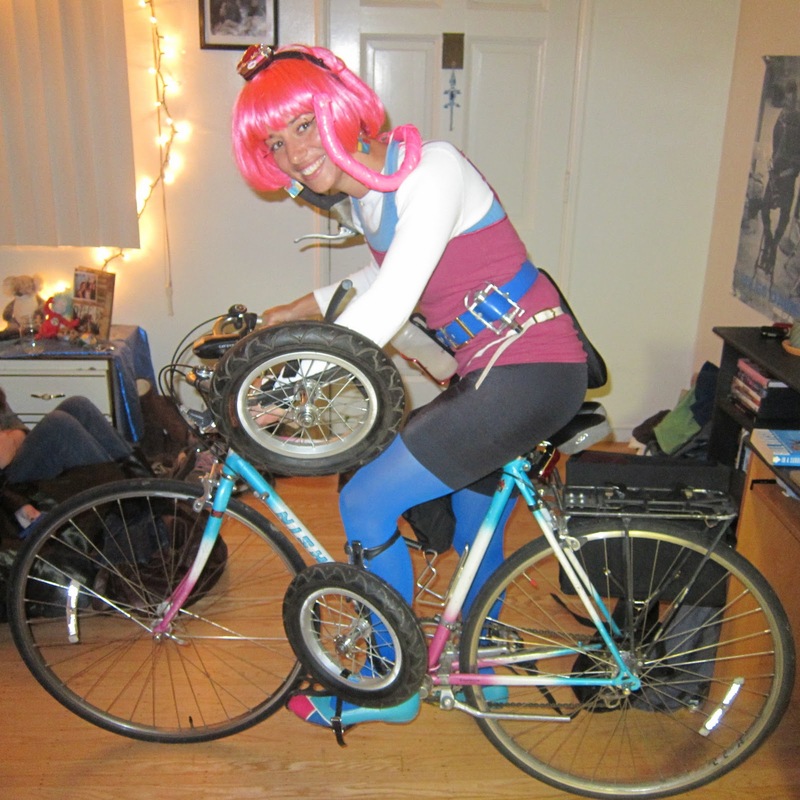 I have a box of bike parts that I've removed and replaced on Sheila over the years, and I have many Sheila-colored (pink, blue, and white) clothing items, but I was unsure how to create a costume out of what I had. So I turned to Google Images which usually never lets me down. But lo and behold, no matter which search criteria I entered, I could not find ANY photos of people dressed AS a bicycle! So it was all up to me. Peddles and water bottle holder attached with a belt around my waist. Bike seat pinned onto my back with reflector hanging off. A pannier hanging off another belt to my right side. Bike tubes precariously wrapped around my limbs. 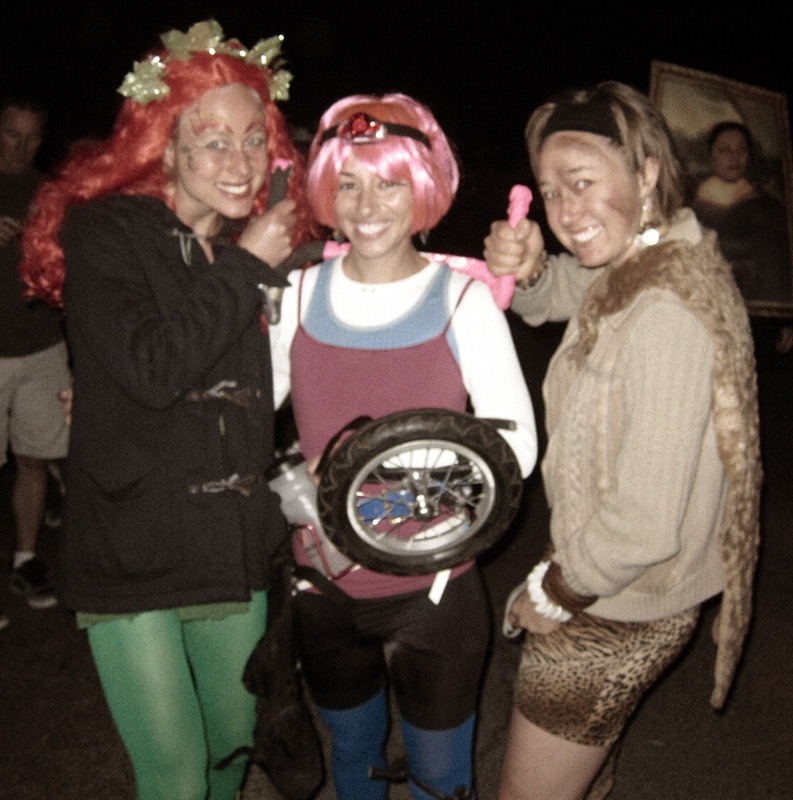 Pink wig with head lamp attached to a head band. And last but not least, handle bars duck-taped to my sports bra with hot pink duck tape. Then off I went to a Halloween party! The next morning I went out for coffee and ran into my friend Skye. After he commented on the giant black lines drawn on my legs (they're SPOKES! ), I told him about my costume. 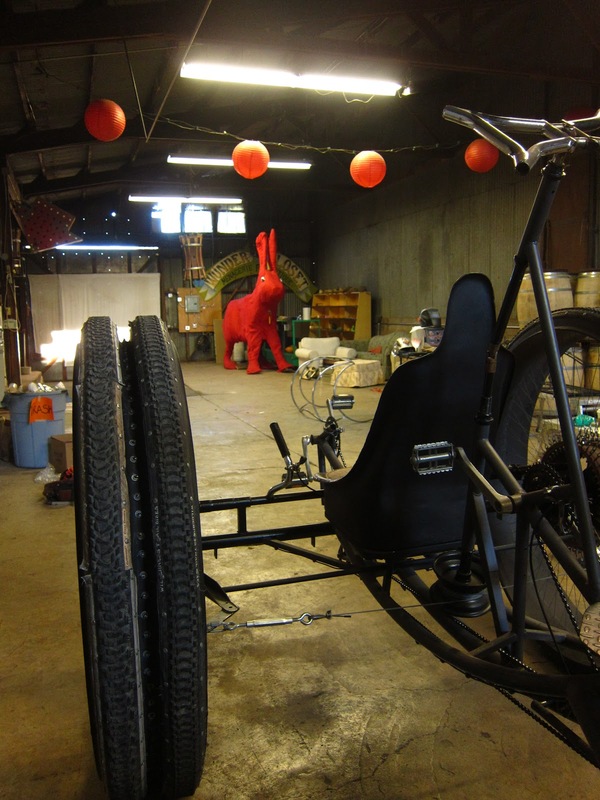 Following the path of those who went before him, he insisted that I NEEDED real wheels. 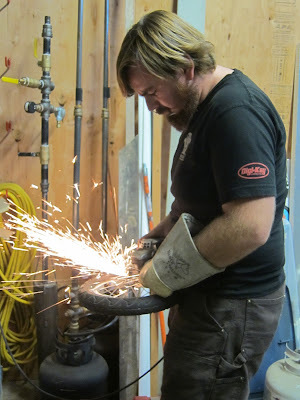 And HE was going to help me make them! Feeling doubtful I agreed to meet him at his shop later that afternoon. REAL Halloween was the following day and on such a short time frame I doubted his ability to throw together such a masterpiece. That teaches me to doubt my friends! I arrived at the shop and we spent the next few hours cutting metal and welding it to wheels which had been removed from a child's bike. In the end they looked like prosthetic braces with wheels attached, AND they were measured to fit my arm and leg EXACTLY! Thus, for Halloween, although it was incredibly heavy and cumbersome, I sported my most epic costume ever. Possibly even better than the She-Ra Princess of Power costume I made from scratch last year. Yes my friends, I was my bicycle for Halloween.